What's your favorite fast food chicken? Discussion in 'The Studio Lounge' started by semipenguin, Dec 4, 2009. What is your favorite fast food chicken? Bojangles' Famous Chicken 'n Biscuits? My favorite is El Pollo Loco that is mostly out in California. 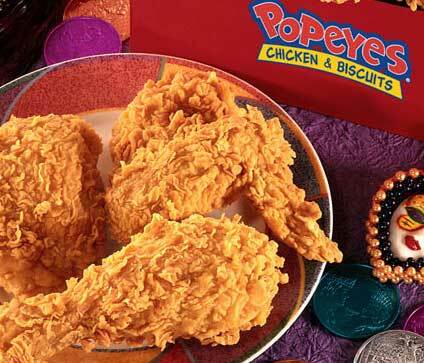 Love that chicken from Popeye's! Here in Grand Rapids, we have KFC and one Popeye's, which is in a crappy part of town. I've eaten at Popeye's twice, and the last time I was there, there were a few cop cars in the parking lot like there was a crime scene. I've made the decision that their chicken's not good enough just to make the drive all the way out there. We had a few Church's, but they all closed. One former location was in an old Sunoco station that's now a local place called Doctor Oil, which reopened the Church's as "The Rooster Express". Not too bad, but nobody beats The Colonel. In my single days, I used to live off Sisters Chicken and Biscuits. They had the best fried and roasted chicken along with great side dishes. Church's Chicken is my favorite. KFC has just degraded so much over the past ten years, it's a health hazard to walk in their now. Their chicken just stinks. Wait, are you talking about the black part of town? I live in the black part of town. We've got lots of chicken joints. KFC is the worst. Church's is a little better. Popeye's is good. My daughter loves it the best, although the service is super slow. For straight fried chicken, Frenchy's is a local chain that has absolutely fantastic chicken. It's spicy like Popeye's, but they use better chicken or something and it just tastes like love. But my all time favorite is Timmy Chan's. The one near me is in an old Pizza Hut. The interior is always filthy. There's a big revolving gate thing between you and the staff. You put your money in, it turns around, and eventually turns around again with your food and change. They make wings and fried rice. They've got 20 different flavors of wings, and they are dirt cheap, like $6 for 20 wings and a heap of fried rice. Mmmmm. Yes, the Popeye's in GR's in a 'black' part of town on Division St., which is, well, far from perfect. As a matter of fact, there *were* a few white folks at the Popeye's the last time I was there. I've also reminded myself that there's many Church's that are in White Castles. Now Grand Rapids could use one of those! Cook the chicken 80% done separately (slice up). Mix with sauce and saute. Add the seeds once everything has thickened. I usually put it over a garden salad (lettuce, spinach, carrot, tomato, beans (kidney/green/garbanzo) with croutons on top. Add some italian dressing if needed - it generally makes it better. Let soak for about a day. Bake and enjoy. I can't eat anything that's deep fried, so when I'm up for some cluck I head to Boston Market or to a local barbecue place. It's too bad most of them closed down about 10yrs ago. A few years ago I delivered a load in the Detroit area and found one in walking distance. Pollo Loco is by far my favorite. i dont bother with the pollo bowls, just the chicken plates with some rice and tortillas (the bowls are mostly rice). KFC original recipe is good every now and then, but it makes you feel like crap a while after you eat it. Yeah, I can't eat KFC original any more, too much of a limp greasefest. But their grilled chicken is not bad once you get used to it. Agree about El Pollo Loco too, I always get the combo with the 2 pieces of chicken and tortillas and a couple of sides (love their pinto beans and spanish rice), just add the house salsa and you've got a good meal there. Popeye's SPICY chicken for me. NOT the regular/mild. They weren't around here as far as I know. I've never seen one. We'll hit the KFC once every 5 or 6 months need it or not. That's usually enough for me. The new grilled chix is nasty! Pollo Loco had one near me for a short while (I live in Salem, NH, it was in Tewksbury, MA) but it closed down after less than a year. When I visit Florida every February I always make a visit to Pollo Tropical.